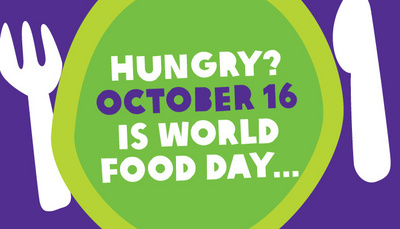 16 October is the UN-designated World Food Day, the date chosen being the anniversary of the creation of the FAO in 1945 with the aim, as stated in its Constitution of “contributing towards an expanding world economy and ensuring humanity’s freedom from hunger.” Freedom from hunger is not simply a technical matter to be solved with better seeds, fertilisers, cultivation practices and marketing. To achieve freedom from hunger for mankind, there is a need to eliminate poverty. The elimination of poverty must draw upon the ideas, skills and energies of whole societies and requires the cooperation of all countries. World Citizens have played an important role in efforts to improve agricultural production worldwide and especially to better the conditions of life of rural workers. Lord Boyd-Orr was the first director of the FAO; Josue de Castro was the independent President of the FAO Council in the 1950s when the FAO had an independent Council President. (The independent presidents have now been replaced by a national diplomat, rotating each year. Governments are never happy with independent experts who are often too independent.) The World Citizen, Rene Dumont, an agricultural specialist, is largely the “father” of political ecology in France, having been the first Green Party candidate for the French Presidency in 1974. To counter these trends, we need awareness and vision, an ethical standard which has the preservation of nature at its heart, and the political leadership to bring about the socio-economic changes needed. For the moment, awareness and vision are unequally spread. In some countries, ecological awareness has led to beneficial changes and innovative technologies. In others, the governmental and social structures are disintegrating due to disease, population pressure upon limited resources, and a lack of social leadership. Worldwide, military spending, led by the USA, dwarfs spending on ecologically-sound development and the necessary expansion of education and health services. Yet there are agricultural techniques which can raise protein efficiency, raise land productivity, improve livestock use and produce second harvests on the same land. However, unless we quickly reverse the damaging trends that we have set in motion, we will see vast numbers of environmental refugees — people abandoning depleted aquifers and exhausted soils and those fleeing advancing deserts and rising seas. David Seckler of the International Water Management Institute writes “Many of the most populous countries of the world — China, India, Pakistan, Mexico, and nearly all the countries of the Middle East and North Africa — have literally been having a free ride over the past two or three decades by depleting their groundwater resources. The penalty of mismanagement of this valuable resource is now coming due, and it is no exaggeration to say that the results could be catastrophic for these countries, and given their importance, for the world as a whole.” Unfortunately, the International Water Management Institute does not manage the world’s use of water but can only study water use. While there are some planners who would like to be able to tax or make people pay for water, most water use is uncontrolled. Payment for water is a way that governments or private companies have to get more revenue, but the welfare of farmers is usually not a very high priority for them. Yet as Citizens of the World have stressed, ecologically-sound development cannot be the result only of a plan, but rather of millions of individual actions to protect soil, conserve water, plant trees, use locally grown crops, reduce meat from our diets, protect biological diversity in forest areas, cut down the use of cars by increasing public transportation and living closer to one’s work. We need to stabilize and then reduce world population and to encourage better distribution of the world’s population through planned migration and the creation of secondary cities to reduce the current growth of magacities. We need to encourage wise use of rural areas by diversifying employment in rural areas. We also need to develop ecological awareness through education so that these millions of wise individual decisions can be taken. Education and vision require leadership, and it is ecologically-sound political leadership that is badly lacking today. Thus Citizens of the World and all of good will are called upon to provide wise leadership to work for a redirection of financial resources to protect the planet, and to encourage ecologically-sound individual and collective action.